We've already begun exploring the beauty of winter weddings in our Color Day posts, but here's a more in-depth look at all the wonderful options available to you on your big day. There are many things that come to mind when you think of winter: snow, ice, hot cocoa, mittens, sleighs... so why not incorporate these ideas into your decor? 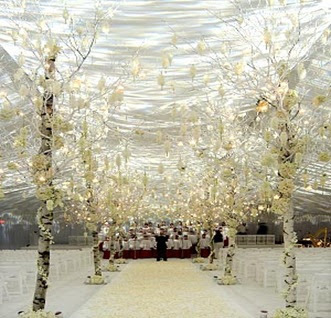 Walk down a snow covered aisle by decorating with a white carpet, white chairs, and white flowers. The white on white look creates an elegant and pristine setting for your wedding vows that you will remember for the rest of your life. A lovely idea is to use Christmas ornaments as place card holders! 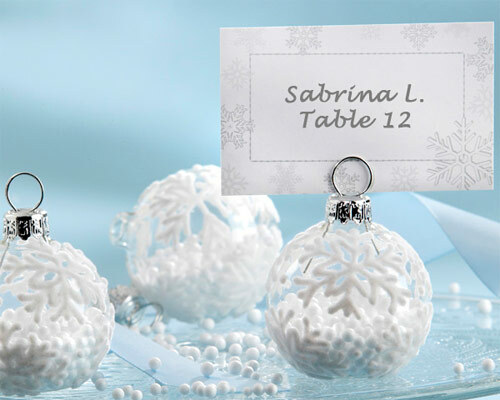 While we're partial to this delicate snowflake design, you could incorporate your wedding colors, add brighter designs, or engrave your names or wedding date to create a one-of-a-kind wedding favor. 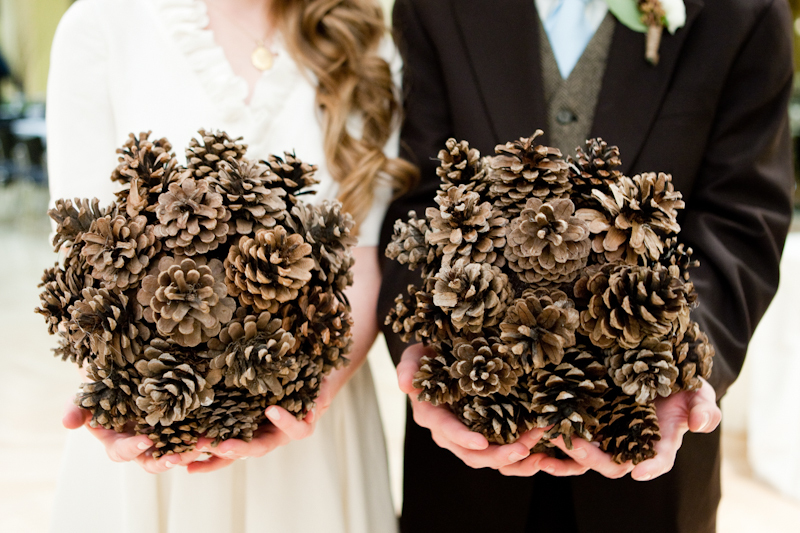 If you're not into florals, have allergies, or are just tired of making choices, ditch the traditional and opt for the pine cone bouquet. It's seasonal, unique, and perfect for a more understated and earthy couple. A more common approach is to incorporate pine cones in your arrangement, but we're all for new ideas and there is something very lovely and down-to-earth about carrying all pine cones. Just be careful when tossing your bouquet! 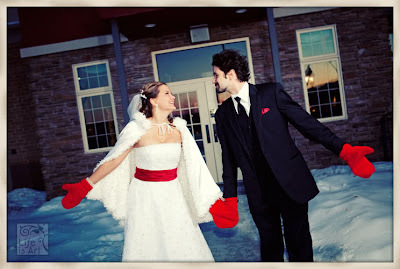 Have fun with your wedding photos and throw on some woolen mittens! It looks very cute, keeps you warm, and you can incorporate your wedding colors so that it all ties together. In fact, get pairs for your whole bridal party... they'll thank you the next morning when they're scraping ice off their cars! 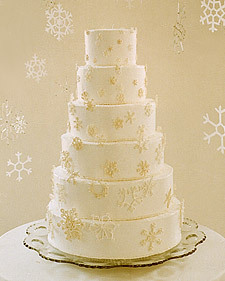 Let it snow, let it snow, let it snow... on your cake! A snowflake design on your cake is such a simple and charming way to add some flair to your dessert. While you can go for a more bold approach, we love the delicate snowflakes and how they add just a bit of texture to the icing. 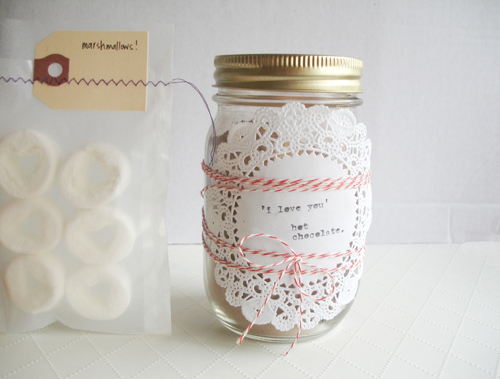 While you'll probably serve hot cocoa at the wedding, how about giving it away as a wedding favor? We love these jars of hot chocolate with little bags of heart shaped marshmallows, but we're especially in love with the packaging! While winter weddings are beautiful, then can be downright frigid! This is especially the case if you plan on taking photos outside, or your ceremony and reception are at different venues. To stay warm, but still look every bit the bride, throw on a faux fur shawl or coat, which is both stylish and practical. Better yet, get some for your bridesmaids too! 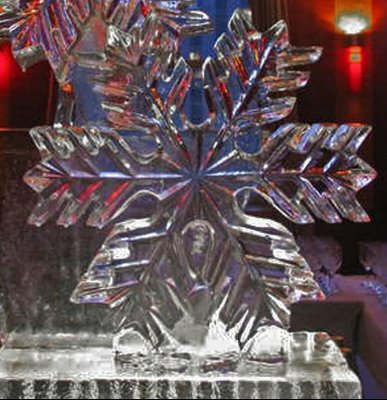 Okay, we're not going to lie... we think ice sculptures are a little over the top. Beautiful, yes... but over the top. But if your heart is set on an ice sculpture, then a winter wedding is the perfect setting for it because, let's face it, having an ice sculpture of a snowflake is much more original than the usual two hearts intertwined. Not a fan of all white or ice blue? Add some color to your wedding with this gorgeous bouquet full of flora and peacock feathers, with just a touch of holly. 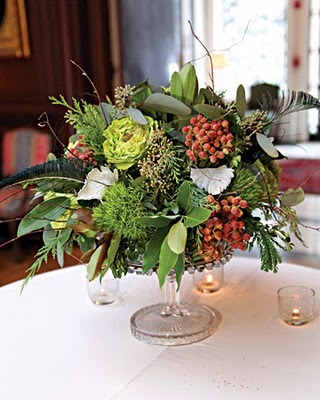 The warm, vibrant colors is perfect for a less traditional winter wedding, but is still very seasonal. Plus, Martha Stewart approves! Nice environment in winter season wonderland. Really your post is enjoyable. Thanks for sharing. i love winter season these scene are looking so great. i am impressed to be here. what a nice images you have shared. i like this kind of site who are telling about photography and share nice images like you. wow nice Wedding photography,I like it thanks for sharing!! !